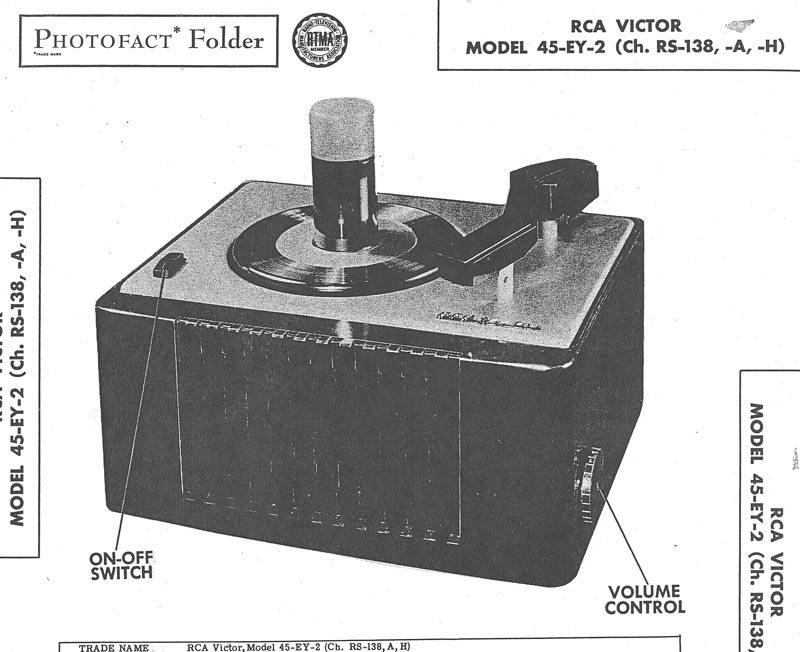 One of the most common of the old bakelite 45 players is the 45EY2 which has an RP-190 Turntable Platter which was one of the most reliable that RCA made. It shows up in many private labels such as Silvertone, Decca, etc. 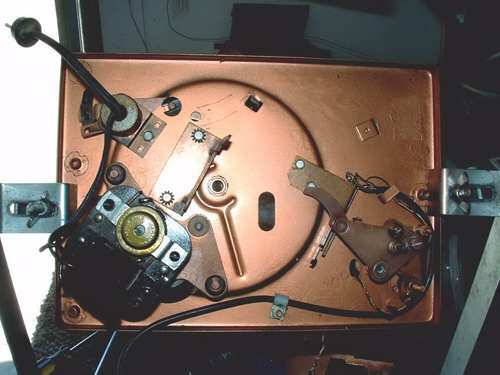 The first item to remove is the bottom cover, then remove the screws holding the top plate to the bakelite cabinet. As you can see, this examples rubber mounting grommets for the motor have completely rotted away. 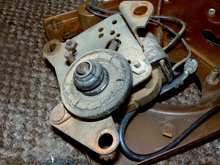 The motor has stiff lubricant as well as all other lubricated parts. The lubricant used in the 50's dried out to a stiff, if not hard, substance. 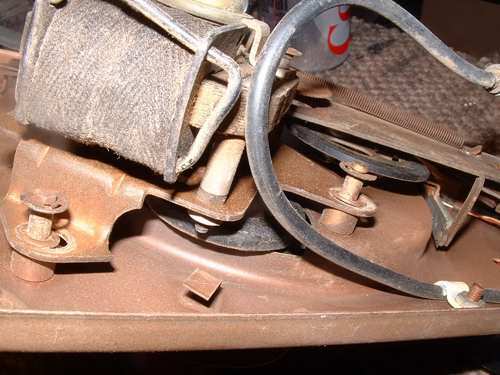 All rubber, drive wheel, cam wheel, and mounting grommets generally turned bad, as the example shown below. The plate has to be completely dissassembled, cleaned and lubed, all new rubber parts installed, but first we are going to paint the plate. I have removed all removable parts, including the Script and knob for the reject and all else and sanded and painted the plate "Antique Ivory". 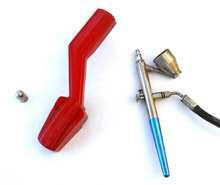 The reject knob was airbrushed to red along with the script. In this picture it has been partially re-assembled and set out to dry for several days. I like to give the paint a minimum of 48 hours to dry, otherwise, it is still soft and can easily be damaged by the careless slip of a tool. All of the pictures in this "How To" can be clicked on to get a larger view. Remember though, they are all copyrighted as is this text so I don't want to see it on anyones web site but mine. You can print it out for your own use only. As you can see, particularly if you click on the image, the assembly has started. Note the new rubber grommets on the motor mount and the cleanliness of the motor which has been completely taken apart and cleaned and new machine oil applied to the absorbant pads that surround the shaft and bronze bearings. 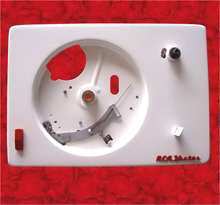 You will note I use a special turntable fixture to hold the plate so I can rotate it and install the parts as they are cleaned and lubed. As you can see from this picture, the motor assembly is in really bad shape. However, unless a unit has been restored at some time, this is how you will find most players at garage sales or ebay. Time has a way of taking its toll on electronics whether they are in storage or continual use. 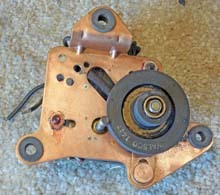 Note the drive wheel and missing motor mounts on the three corners of the motor drive plate. Amazing what a little elbow grease can do. The plate has been cleaned with a metal cleaner, new rubber mounts installed and a new rubber drive wheel. Be sure and check the tension of the spring pulling back on the drive wheel mechanism. They get weak after a while. The lube has been cleaned off and new lubriplate applied to all contacting surfaces, except any rubber of course. In fact, be extremely careful of getting even finger oil on the flat drive surface of the drive wheel. I use soft white cotton gloves when handling the drive wheel. The ugly old brown bakelite cabinet has been scrubbed, sanded, primed with grey automotive primer and then given a smooth coat of the "Antique Ivory" paint. It has now been set aside for 48 hours of dry time. Nothing worse than at this point scabbing up an otherwise perfect paint job. Using a good pair of scissors, cut the decal from the sheet ao it looks like this one. You want a close cut but not to the actual edge of the decal as you need a little overlap of the decal so after it has been soaked in lukewarm water for a few seconds, you can slip the decal from it's backing. 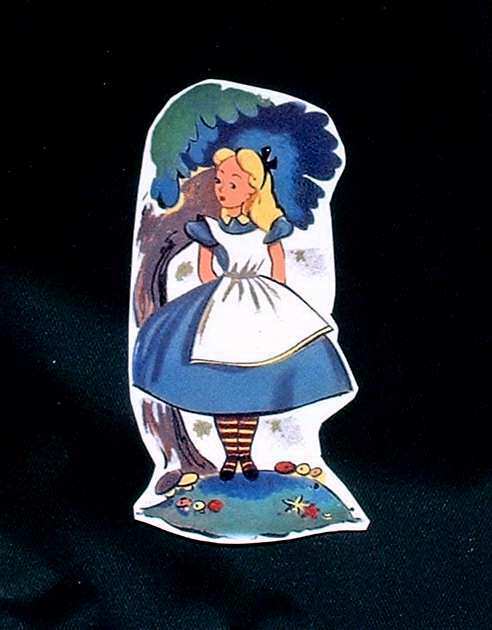 Once the decal slides on the backing, place it on the item to be decorated and slip the decal away from the backing about 1/2 and inch. Hold it against the item with a finger and slip the backing out from between it and the item. Using a brush or as I like to use, a new acid brush because it is a little stiffer than a small paint or makeup brush. 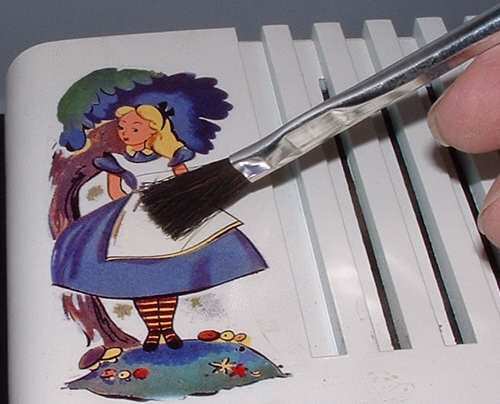 Slide the decal to it's exact position and using the brush, work from the center outward and smooth out the bubbles or wrinkles that may be present. Smooth the decal until it is perfectly smooth. Using a soft paper towel, pad the decal to remove any excess water. Allow it to dry 24 hours. After the new decals have been applied, allow 24 hours to dry. 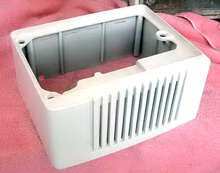 Then, spray the entire cabinet with several good coats of Krylon clear lacquer to protect the paint and the decals from fading or accidents. Krylon can be purchased at most hardware outlets. While the cabinet is drying, spray the turntable and the arm a bright red, the same color being used on reject knob, etc. 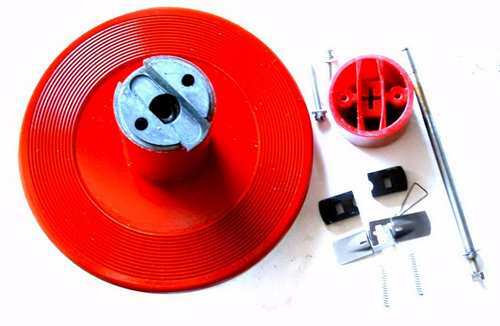 Assemble the turntable, arm, and all of the necessary parts to make the turntable as new. Installation of a new cartridge in the arm, new tubes and capacitors in the amplifier, complete the project. Using an airbrush, or spray can if your really good with one, paint the tone arm red also.. Everything on the top side should now be red or Ivory. 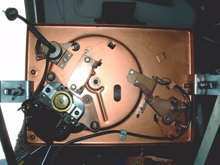 Install a new cartridge and needle and new wire if needed. I will cover this in a later edition. A once brown bakelite record player has taken on new life. 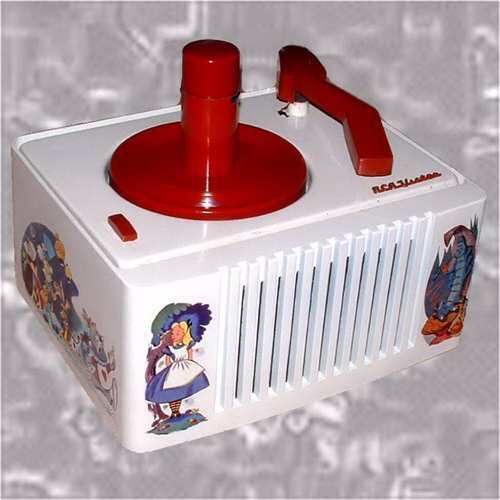 It is now a duplicate of a rarer "Alice in Wonderland" player. 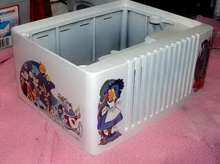 My next article will be on the restoration of the electronics found in this and most other players. 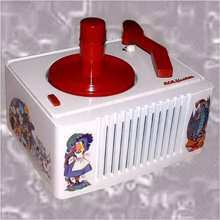 Check my website under vintage record players. I have decal sets for all of the "Disney" players. Some of the players use a different model player. I will be glad to let you know which player uses which decal. Just email me thru the contact us link at the top of the page.